*Online reservation system opened to the public yesterday morning, November 23 at 12:01 a.m.
Chrysler Canada announced today that the Fiat 500 Prima Edizione models which became available to the public this morning at one minute after midnight were completely sold out in 12 hours. Five hundred of these limited edition vehicles were offered for sale, each with a unique numbered badge. Canadians secured one of these vehicles with a $500 deposit. "I don’t think Game Seven of the Stanley Cup Finals between the Leafs and the Canadians would sell out this fast," said Reid Bigland, President and CEO of Chrysler Canada. "Frankly, this just underscores the interest Canadians have in a youthful, stylish and highly fuel-efficient car. The 2008 European car of the year, the Fiat 500, is just that." The Fiat 500 Prima Edizione is exclusively available in three colors: Bianco (White), Rosso (Red) and Grigio (Gray). Two equipment levels are offered, and the vehicle features the state-of-the-art 1.4-liter MultiAir® engine coupled with a manual five-speed transmission. Production of the Fiat 500 starts in December and the vehicle will begin to arrive at Canadian Fiat dealerships in early 2011. 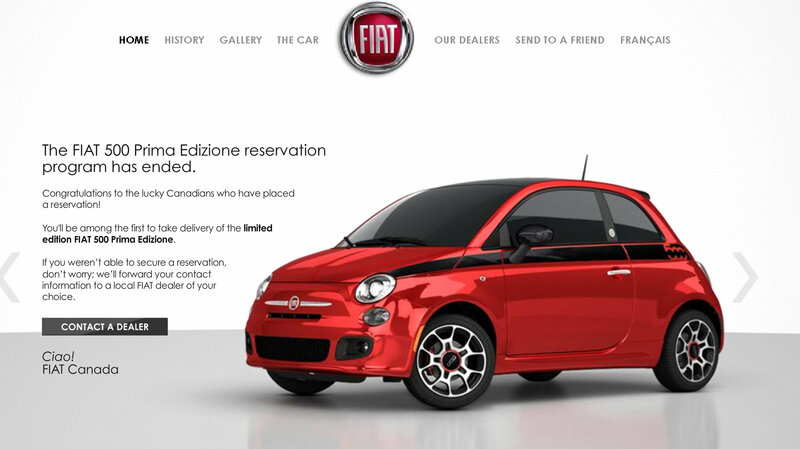 Consumers who were not able to reserve a Prima Edizione can sign up to become a "Fiat Follower" at Fiat Canada. Followers receive regular news and updates about the Fiat 500, including where to find a dealer in their area. Founded as the Chrysler Corporation in 1925, Chrysler Canada Inc. is based in Windsor, Ontario, and celebrates its 85th anniversary in 2010. Chrysler Canada's product lineup features some of the world's most recognizable vehicles, including the Dodge Grand Caravan, Jeep® Wrangler and Chrysler 300. Chrysler Canada is a wholly owned subsidiary of Chrysler Group LLC, one of the world's leading automotive companies. Chrysler Group LLC, formed in 2009 from a global strategic alliance with Fiat Group, produces Chrysler, Jeep, Dodge, Ram Truck and Mopar® vehicles and products. With the resources, technology and worldwide distribution network required to compete on a global scale, the alliance builds on Chrysler’s culture of innovation – first established by Walter P. Chrysler in 1925 – and Fiat’s complementary technology – from a company whose heritage dates back to 1899. Fiat will contribute world-class technology, platforms and powertrains for small- and medium-sized cars, allowing Chrysler Group to offer an expanded lineup of fuel-efficient vehicles well-suited to Canadian customer needs.